"We are grateful to the jury and the court for their service," Apple stated to the media. "Today's ruling reinforces what courts around the world have already found: that Samsung willfully stole our ideas and copied our products. "We are fighting to defend the hard work that goes into beloved products like the iPhone, which our employees devote their lives to designing and delivering for our customers." Apple won infringement claims involving both its Slide to Unlock and Apple Data Detectors patents, but lost its arguments involving background sync and Universal Search, the patent it was seeking the highest royalties from, and which involved an indemnification for Samsung by search giant Google. Apple's '172 patent related to text input prediction and spell checking, had already been ruled infringed by Judge Lucy Koh. For that patent, the jury found Samsung willingly infringed Apple's intellectual property. The three out of five verdict is only a minor win for Apple, but the three patents effectively amount to a $6.40 royalty per unit among the devices found infringing. The majority of the damages were accrued by Samsung's Galaxy SIII flagship, which introduced in May 2012. Galaxy S3 the big hit, $52 million of the total. No damages for Galaxy tab. 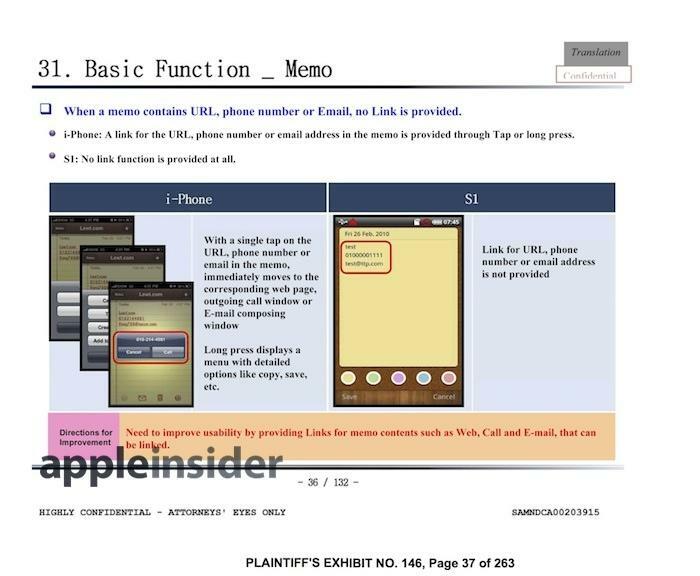 The jury is being retained to reconsider their decision to award Apple $0 in royalties for the even older Galaxy SII, which the presiding Judge Lucy Koh determined was not appropriate, noting that the device should either be found non-infringing, or should involve a reasonable royalty. Apple had earlier sought to also add Samsung's newer, top selling Galaxy S4 to the lawsuit, but was prevented from doing so by Judge Koh due to limited timing. However, both it and its Galaxy S5 predecessor also infringe the data detectors patent, meaning Apple should be able to expand Samsung's total liability. Judge Koh hasn't yet ruled on whether Apple will be able to expand the current damages due to willful infringement, or whether she would allow a sales ban on the infringing GS3 or substantially similar devices, including the GS4 and GS5. Such a ban would have catastrophic consequences for Samsung, even if it were imposed only temporarily. The same judge decided not to impose a sales ban in the first trial, even after Samsung was found infringing, because she said she had not been convinced that the damage to Apple by the infringement warranted more than monetary damages. Apple previously won an injunction in a different venue--the U.S. International Trade Commission--over the same Data Detectors patent against HTC, which subsequently struggled with removing the feature throughout 2012 before it decided to instead agree to a licensing agreement with Apple. Apple was also recently cleared to again argue its Data Detectors patent against Motorola, nearly two years after that parallel case had been delayed by Judge Richard Posner's opinion from the summer of 2012, which dismissed it along with all of other claims Apple and Google had presented.